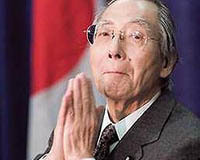 Masadzuro Siokava stated leading industrial countries have to make a unified effort in respect for the dollar not to fall below a 100-yens level. The prime-minister underlined the dollar as being considerably weak. The exchange “yen-dollar” rate must be 125-130 to 1, Ministry of Finance head said. The thing is that although all in all American economy is considered as strong, the last series of scandals, around “Enron Corp.” and “WorldCom Inc.” considerably undermine market trust and provoke the dollar devaluation. According to Masadzuro Siokava, if declined below 100-yens point, the US government will have to unloosen its non-involvement practice, and, together with Tokyo take measures for the dollar exchange rate support. In how the events evolve may damage world economy as a whole and force all of the big players on the world market to act in simultaneous cooperation. At present the dollar costs 116.86 yens, 14% less now it was worth 6 months ago, in January. The Ministry of Finance of Japan is doing mass currency transactions interventions from its part, in order to support the US currency. In addition dollar trust may wane because of the scandals where both the president and the vice-president are present. For example, one blames George Bush to be connected with the so called “insider trade of shares” (based on access to internal type of information). According to newspaper “Times” , in 16 days before selling the shares G. Bush received a weekly account on the corporation’s expected large losses. As the newspaper mentions it, this information gives Bush’s opponents an extra trump card to put press on him.